Forgot to mention I'm using Phpstorm 6.0.3. I've solved the pinning of views to sidebar. 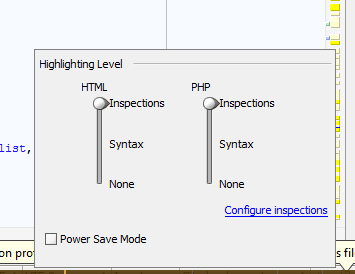 The Views > Tool Buttons was disabled.Still not seeing why intellisense isn't working. What do you mean by "stopped working"? Does IDE offer any code completion? or marks standard PHP functions/classes are "unknown" (or something like that)? Details/screenshots please. In any case: Have you tried "File | Invalidate Caches..."? -- usually helps when such "suddenly stopped working/green code is shown red" happens.